I recently lost my GSD. He was the first dog I ever owned and he was the most amazing dog a person could ask for. It's been a couple months since I put him down, but I've been struggling with the loss a lot recently. Thank you for posting this article, it has definitely come at the right time in my life. I have lost two furry babies in the past, an eight year old Cocker spaniel, and later a twelve year old Labrador retriever. Both animals I had since they were eight weeks old. Someone told me once that to give another animal a home is a memorial honoring the lost friend. I now have two ten year old labs that I again have had since they were puppies. It helps to console me that when it is time for them to die, I have had the privilege of caring and loving them for their lifespan that they were meant to live. They were safe, happy, and extremely loved for the time they lived. I lost my 12 yr old male, Bandit in June. I was with him to the end as they put him to sleep. He stopped eating and went from 20 pnds 3 yrs ago to 12. The vet finally tested for liver desease. We tried meds, no luck and he went to 10 pnds during the treatment and us deciding we didn't want him to suffer from starvation. He was a ragamuffin and my way of grieving turned out me missing him and looking at Ragamuffin's for sale. I fell in love with a brown and white one. THe day we picked Bandits ashes up a beautiful Rainbow appeared that day. Needless to say the breeder also had a kitten named Rainbow. I had to get them both. So I now have 2 sisters, Patricia and Rainbow. I 100% believe that other pets know when their companions are ill and/or pass away. When we lost our Gracie, Stella laid at the front door for days as though she were waiting for her to come home. When we buried Gracie, we had Stella with us, and she sat at the gravesite for a very long time after we left. She knew her best friend was there. 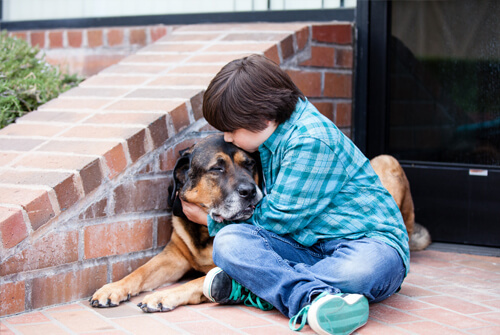 This is an excellent article about pet loss. Pets are part of the family and should be acknowledged so. Having the family at home all around is a good plan and explaining to children about death is important. In the summer of 2015, we said goodbye to our 10 year old greyhound, and 6 weeks, later, we lost our 14 year old cocapoo mix. We were fortunate to have our greyhound euthanized at home, on her forever sofa. We tried to have her younger greyhound sister (and best friend) witness this gentle passing, but she was to nervous having the vet (a stranger to her) in our home and spent most of the time upstairs. But, I do believe she was able to understand what was happening. She was horribly depressed after losing her friend--her grief was a profound change in her normal happy personality. One week later, we adopted another greyhound. I do agree with allowing the other pet(s) be witness when another pet is passing and always advise my clients to do the same if they are able. Thank you for the great article. We lost our two fur babies almost one year ago and the loss is still very painful. We lost our yellow lab suddenly to heart failure and then less than 10 days later, lost our boxer to cancer. Our lab had been slowing down due to age and I know that our boxer knew this - she would follow Clara around and just watch her. Our boxer never slowed down or gave us any idea that she was in pain. Until the day we learned she had cancer and was bleeding internally. She was not the same after our lab passed away. What we thought was deep grief was that and the pain of the cancer she had. She was a feisty boxer and loved Our lab dearly. Our loss of both babies was so sudden we were in shock. We knew that it would be months before we could even think about rescuing a baby, then one afternoon visiting a doggie adoption we fell in love with a boxer/mastiff mix. She is headstrong like our boxer and extremely gentle like our lab. When she looks at you, you can feel her looking all the way to your soul! We felt that our babies were talking to us to let us know that it was time to help our hearts heal. While the pain of grief is still sharp, we find comfort knowing that our newest baby has the best traits of the precious babies we lost.